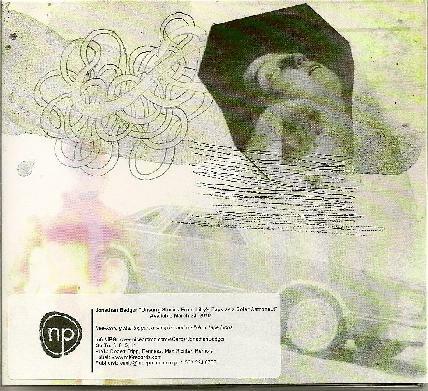 Jonathan Badger is a composer based in Baltimore, Maryland and this seems to be his second album?! THE VESSEL MEGALO: begins with a dark industrial riff and then comes the drum machine!? Somehow conjures early 80's acts like Foetus! Pretty engaging with good energy, no vocals! Goes into a lighter outro with space keyboards. Oh, great album title by the way!! HIS FACE LIKE GLASS TO THE TOUCH: totally opposite from previous track, operatic avant-garde female vocal with piano then some electric lead guitar. BEAT 1: electronic pulse, more early 80's vibeness, very Fripp/Eno-esque! All my buddies in '85 were going for this sound on their 4 track tascams. NEUROSMITH: more lopey electronica. THE FIRST TIME I DREAMT OF THE SURFACE THERE WAS NO ONE TO HOLD: another great song title, does it mean that Jonathan is from Hollow Earth?! Pulsing spaciness, no drum machine on this one yet, thank goodness! More Frippertronicnesss! HER EYES IN SUNFLARE: quiet pulse, more pleasant lovliness! Nice and droney also. THE INSIGHT THAT COMES FROM REPEATED TIME DILATIONS: yet another great title, trippy uptempo drum machine and tinkly pianer! THEY SEARCHED FOR EACH OTHER IN THE SHELTER OF MERCURY: yes, there are no vocals on this album!, which is usually a good thing! SURFACE: primitive drum machine riffage. It's okay, a little unspectacular but still mesmerizing. Yes, Jonny B. is from the Inner World... crinkly soundin' stuff, yeah! Gets quite swoll and angelic and uber crinklin' at the end!! LUCIUS: farty poppy noises, oh yes! Who doesn't like them!? Then big skronkin' noise! Now quiet swellness!